With the warm weather and many family members on summer break, we eat so many great, delicious foods in the summertime at get-togethers and block parties. Remember that while it’s ok to indulge yourself every once in awhile, you can still find some healthy food choices while you’re out enjoying the nice weather with family and friends. Here are some healthy foods to look for this summer. Blackberries, blueberries, strawberries, and raspberries are all high in vitamin C, a vitamin that can help prevent cognitive decline. One study looked at women who added strawberries and blueberries to their diets and found that women who consumed two or more servings of dark berries per week showed a reduction in memory decline. Another study found that blackberry extract can help to improve balance, coordination, and memory function. From deviled eggs to egg salad, you can find this high-protein food in many summer dishes. Instead of mayonnaise in your recipes, try using Greek yogurt to make your eggs healthier. Along with protein, eggs contain vitamins A, D, E, B6, and B12. Make sure you eat the egg whites as well as the yolks. Egg yolks contain choline, lutein, and zeaxanthin, all nutrients that are good for your eyes. With eggs, you don’t have to do anything fancy. Just hard boil one or two and you’re good to go with a healthy snack. Few things are more refreshing than a big glass of iced tea after you’ve been out in the summer heat. The compounds inside of teas have been found to reduce your risk for stroke, heart attack, and cardiovascular disease. Teas can also boost your immune system and help you fight off certain cancers. Remember when you drink tea, avoid adding lots of sugar to it. Add fresh fruits and herbs, like melons, mint, or tropical fruits, and if you need a little sweetener, try adding a few drops of honey. 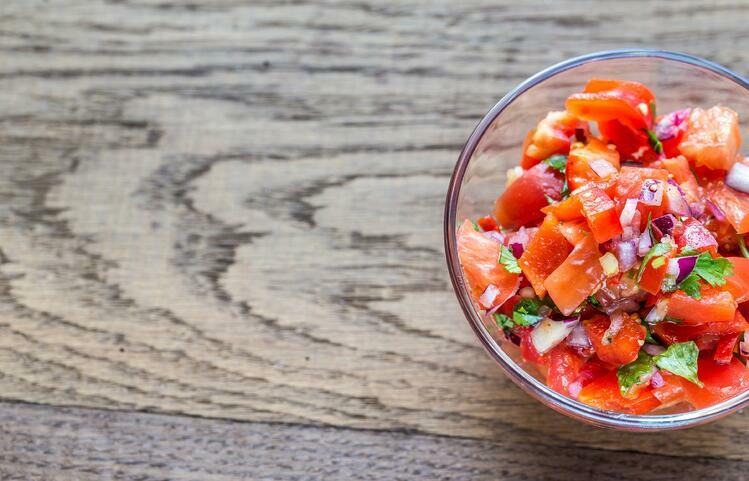 Eating salsa can help you get some of your needed daily vegetables. Tomatoes are a particularly special food. They contain lycopene, a naturally-occurring antioxidant that gives many red and pink foods their color. Eating foods high in lycopene can help you prevent heart disease, certain cancers, and it’s great for eye health. It has been found to reduce one’s risk of cataracts. Like tomatoes, watermelons also contain the antioxidant lycopene, and as their name suggests, they also contain a lot of water and can help to keep you hydrated during those long, hot summer days. Watermelon also contains vitamins A, C, B6, and potassium, a nutrient that is great for anyone suffering from a potassium deficiency. Potassium deficiency is commonly seen in seniors due to certain heart and blood pressure medications.